Once limited to naturopaths and natural health practitioners, broad-spectrum micronutrients supplementation has matured from an alternative mental health solution to an empowered choice for doctors and consumers seeking to foster both brain and gut health. As a recent entrant into the micronutrients space, MicroNourish has set a mission to help catalyze this paradigm shift and support wider education about the role micronutrients can play in supporting mental wellness. 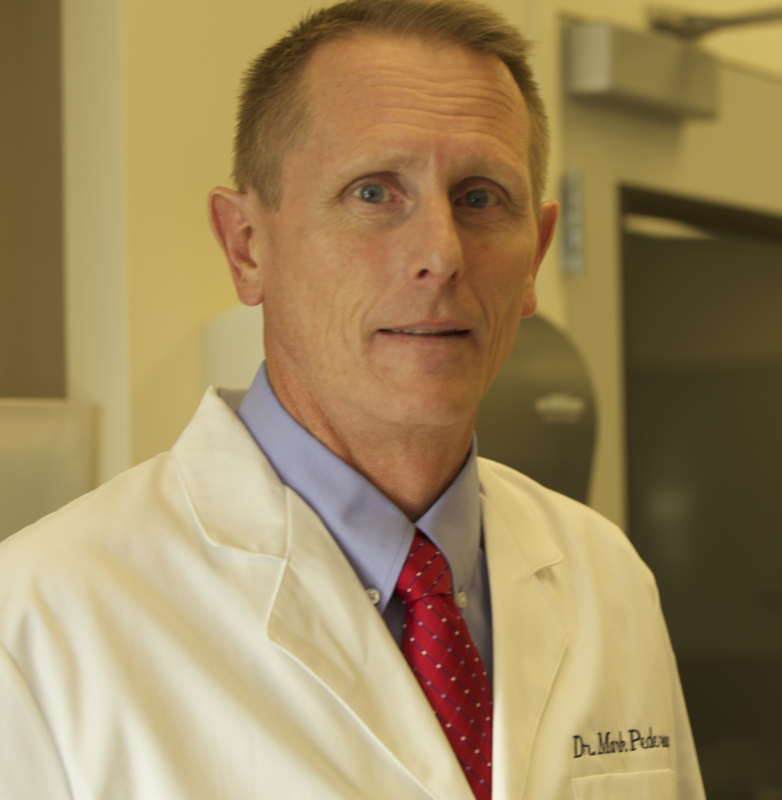 Practical results have been so promising that they have spurred numerous field studies, clinical trials and tracked case-studies that point to a steady intake of a wide range of micronutrients as being key to a balanced mind, not only for those struggling with mental health issues, but also for those seeking everyday brain health and a positive outlook. 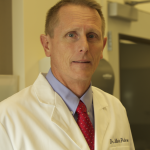 The study of micronutrients in mental balance has ranged from scientists exploring the application of singular micronutrients – such as the link between Zinc and Vitamin D deficiencies and depression – to the study of complementary sets of nutrients, like B Complex Vitamins for mood balance, to the use of broad-spectrum micronutrients in people with ADHD. Meanwhile, organic growth has continued through practitioners’ successes. In her book The Mood Cure, Dr. Julia Ross documents her experiences using micronutrients, including amino acids, at her holistic health clinic in San Francisco as part of biochemical rebalancing plans – or nutritherapy – for people struggling with mood problems and eating issues. The scientific team behind MicroNourish have seen similar results from open label trials and case studies: individuals and health practitioners have reported an increase in focus, better digestion, calmer stress responses and less mood swings when taking the broad-spectrum micronutrients found in the flagship micronutrient product, MicroNourish Core. * The goal in launching MicroNourish Core was to combine the scientific studies, clinical experiences and latest research into nutrient ratios for bioavailability; the end result being a flagship formulation whose synergistic whole is more efficacious than the sum of its parts. Inquisitive consumers are making the connection: If micronutrients can improve symptoms in people struggling with mental health, could the decline of micronutrients in the daily diet be contributing to the increase in everyday stress, mood swings and difficulty focusing? Indeed, in a recent survey conducted by MicroNourish, 39% percent of respondents said they believed lack of nutrients contributed to their stress levels. These insights reflect a new wave of consumers: empowered to take health decisions into their own hands by understanding what they are absorbing. You only have to look at the hottest lifestyle and dietary trends – from the rise of “Superfoods” and “Nutrient-Rich” products, to the increase in “Plant-Based Diets” and “Veganism” – to notice they are all styled around the promise that increasing micronutrient absorption is the key to achieving optimal physical and mental health. There are converging factors likely contributing to the emergence of these investigative consumers. A host of books and documentaries, such as In Defense of Food. and Food, Inc., have shone a spotlight on how challenging it can be to absorb a wide variety of nutrients from the Standard American Diet (SAD) – because of modern lifestyles, an increasingly complex supply chain and the sharp decline of minerals in fruits and vegetables (as documented by the US Department of Agriculture). The coinciding rise in the registration of Health Coaches at schools such as the Institute of Integrative Nutrition, along with the growth of celebrity health blogs, are further bringing the benefits of live micronutrition to everyday conversations and consumers. The most likely factor of all though: people just want to feel better. In the MicroNourish stress study mentioned earlier, 69% of respondents said they experience stress levels above 60% on a daily basis, with 43% saying they eat more when stressed, and 50% saying their digestion is impacted by stress. It’s no wonder that ambitious individuals are seeking ways to take stress-management and digestive health into their own hands. As more people feel the difference from taking high-quality micronutrients, it stands to reason they will become more discerning about absorbing wisely in general. MicroNourish customers ask increasingly pertinent questions about the ingredients: examining the label before purchase, inquiring about whether there is gluten and lactose in the formulations and, most notably, asking increasingly about the form of nutrients used. These consumers are educating themselves on the benefits of choosing Methylcobalamin, Methylfolate (MTHF) and Cholecalciferol – the active and more bioavailable forms of B12, Folic Acid and Vitamin D – and are willing to pay for the upgrade. They are reading about the importance of minerals being chelated with (bound to) amino acids to optimize transportation through the digestive lining and are thus less willing to settle for low-grade minerals. MicroNourish prioritizes bioavailability and gastrointestinal absorption as reflected aptly in its tagline, You are what you absorb. After all, micronutrients can only kick-start your brain and body if they make it to your cells. That’s why the MicroNourish flagship micronutrient formula is blended with high-performance chelated minerals and bioavailable vitamins, and enhanced with amino acids like L-Glutamine and herbal extracts: to help increase the synergistic benefits of the nutrients for brain health while simultaneously nourishing the gut for optimal absorption and gut-brain balance. The Gut-Brain Connection: Turning A Vicious Cycle Into A Virtuous Cycle. Indeed, with the mounting evidence showing the key role the gut plays in mental wellness, it would be amiss to tackle brain health without addressing the gut simultaneously. The scientific community has long referred to the gut as the ‘Second Brain’, acknowledging the impact that digestive health and the Enteric Nervous System (ENS) have on emotions. 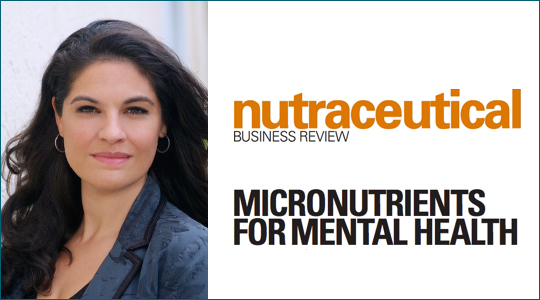 However, recent breakthroughs strongly linking the health of the microbiome – which we already know help utilize micronutrients – to state of mind indicate that more tailored nutrition for the gut could further improve mental health outcomes. The Micronutrient Information Center at Linus Pauling Institute just announced results from its latest study, just one of many presently exploring the relationship between changes in diet to the gut microbiome and how that impacts cognitive flexibility. The results suggesting “changes in the microbiome may contribute to cognitive changes associated with eating a Western diet,” indicate: this is just the beginning. 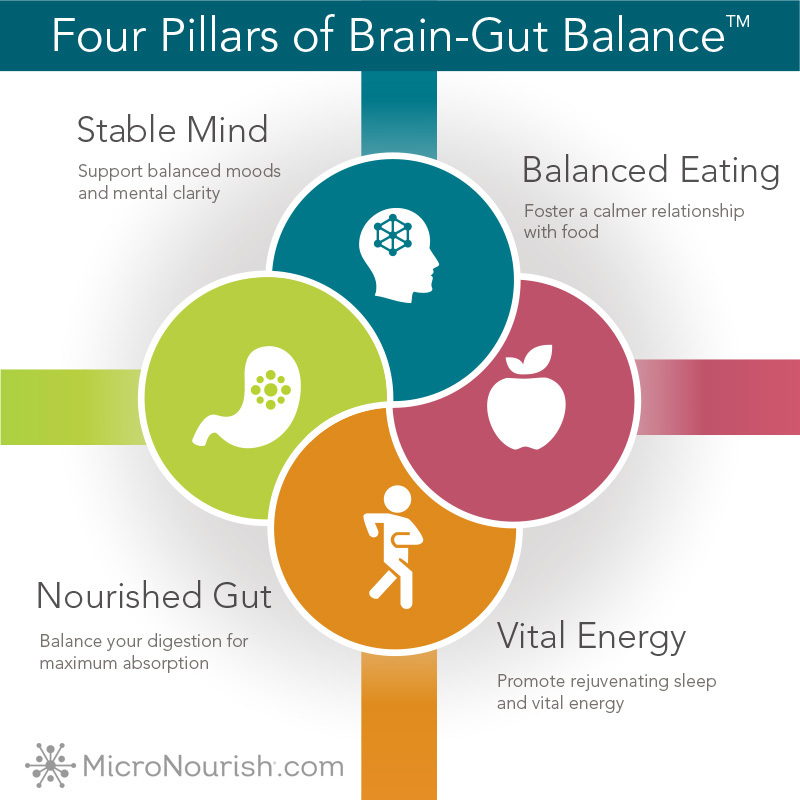 That’s why MicroNourish invites customers to track and strengthen the four pillars that together support both brain and gut balance: State of Mind, Eating, Digestion and Energy. When one of the pillars is out of balance, the others tend to follow. For example, when someone is going through a stressful few days, they are more likely to eat erratically, have digestive issues, and have poorer sleep. Likewise, most people will notice that if they eat too much sugar and caffeine they will have increased distractibility, gut complaints and energy swings. 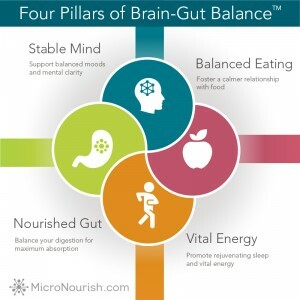 That’s why the MicroNourish System targets brain and gut health with premium micronutrients, probiotics and enzymes simultaneously, and why the MicroNourish Magazine was launched to help educate people in lifestyle choices they can make to help support the Four Pillars of Brain-Gut Balance on a daily basis. 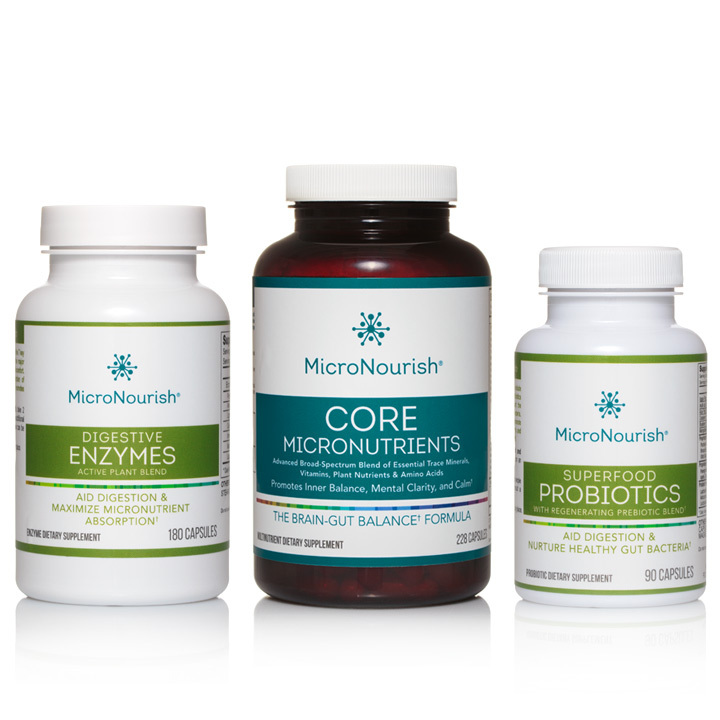 The MicroNourish System was designed to support the four pillars of brain and gut balance simultaneously with the premium flagship formula, Core Micronutrients, along with Digestive Plant Enzymes and Superfood Probiotics & Prebiotics. It is an exciting time to be in the world of micronutrients and brain-gut health. Scientists, doctors and consumers are paying attention. The mounting body of research connecting micronutrients and gut health to mental wellness will no doubt lead to a future where personalized micronutrient formulations will target individuals’ brain and microbiota needs and even be tailored to each person’s unique rate of nutrient absorption. This increasing emphasis on broad-spectrum micronutrient supplementation as a legitimate key to brain health will help set a new standard for what it means to feel mentally-well: where focus, mood balance and calm will become the norm, not the exception. Because, You are what you absorb®. • Manganese: Required for the synthesis of two key neurotransmitters and supports brain function. *These products and statements have not been evaluated by the Food and Drug Administration. They are not intended to diagnose, treat or cure any disease. Effects of high-dose B vitamin complex with vitamin C and minerals on subjective mood and performance in healthy males. Kennedy Do, et al. Psychopharmacology (Berl). 2010 Jul;211(1):55-68. doi: 10.1007/s00213-010-1870-3. Epub 2010 May 8. Changes in USDA food composition data for 43 garden crops, 1950 to 1999. David DR et al. J Am Coll Nutr. 2004 Dec;23(6):669-82. Relationships between diet-related changes in the gut microbiome and cognitive flexibility. Magnusson et al. Neuroscience. 2015 Aug 6;300:128-40. doi: 10.1016/j.neuroscience.2015.05.016. Epub 2015 May 14.